Well. Hard to even figure out how to start this one. Let me start this way. Yesterday I posted this. Okay. I understand that the restaurant is your livelihood. I get that. We all have the right to make a living and do so in whatever way works best for us within the confines of the law. Oh. I said WITHIN the confines of the law. That sign did actually break a few, not to mention it was morally repugnant. So then, his bestie at the local newspaper, pens this. If you don’t want to read the entire article, or give his newspaper more clicks then it deserves, I’ll quote portions of it here, and break it down for everybody, including the author, Mr. Perry White. 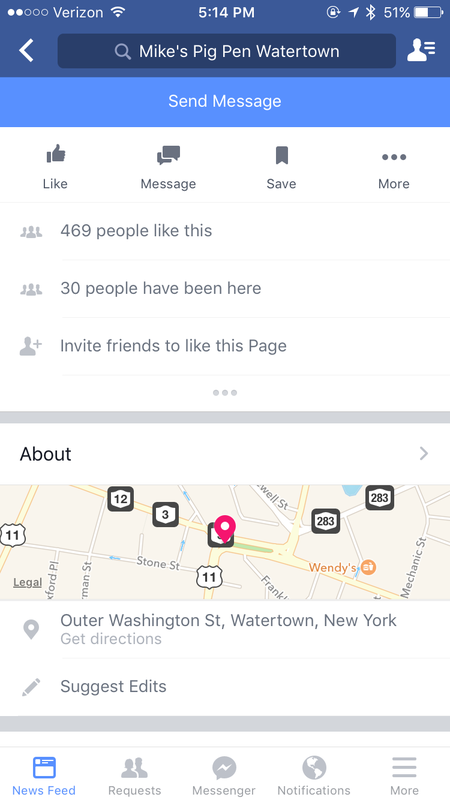 That quote was in reference to the outrage that ran through the T1D community yesterday when the picture of the sign that was hung in the restaurant was posted ON the restaurants page BY the restaurant. So. People outraged about a sign is the same as someone killing people. Great moral compass there Mr. White. Sorry, but I’m not going to ask anyone to stick a needle into their skin, in the same place where people (excuse the term) poop, potentially causing the introduction of infectious materials into their insulin or their body, because a few people were uncomfortable. That’s unsanitary, and frankly ridiculous. First off. I’m so very sorry that you have such badly controlled Type 2 Diabetes that you are taking insulin. May I recommend a gym membership and a better diet than Mike’s Pig Pen? (also, do me a favor and read this, it goes into more depth of how I actually feel about a lot of type 2’s). I am also so sorry that you have to take insulin before your “main meal”. My darling husband, and all other REAL diabetics like him (you know the ones that can’t lose their disease, and have been on insulin since they were CHILDREN), have to take insulin before or after EVERY meal, not just their “main” meal. They also have to take a long acting once or twice a day, and correct for any highs that may occur during the day. Look it up. Educate yourself. Type 2 is NOTHING, and I mean NOTHING like Type One. The only similarity is the name, and SOMETIMES the medications that are taken. Speaking of the children part, you’re telling me that a parent should take their squirming, restless, possibly scared, diabetic child (as young as infant or toddler age) into a BATHROOM where they could likely end up on a floor, or having to sit them on the toilet or counter to give them their necessary insulin shot. Right. Let me know how that works out. Oh, and you’re “forced” to take your pen with you. Right… again, so sorry. We carry a case with my husband’s insulin EVERYWHERE we go. Because it’s how we keep him alive. 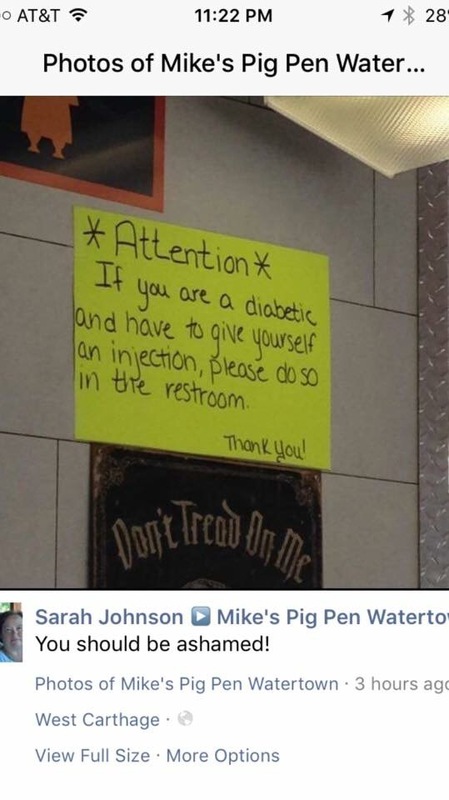 And being that we live in the south, it travels into every restaurant, store, or friend’s house we go into, since insulin shouldn’t be kept in the heat. Damn right we’re activists. SOMEONE has to stand up for the Type 1’s to shout down all you squeaky wheeled Type 2’s. Watched TV lately? How many NEW AND IMPROVED medications are out there for Type 2’s and how many are out for Type 1’s. Get a grip. And NO ONE said they were going to stand on the counter. They just wanted to be able to inject at their seat, and not be shoved like some pariah into a dirty bathroom. I know needles make other’s uncomfortable. I have a daughter that doesn’t exactly enjoy watching her dad give himself shots. BUT. She also knows that it is what KEEPING her father ALIVE. And so if she doesn’t to see, she like everyone else on the planet, can LOOK AWAY. You are correct. There are lots of important causes. Type 1 Diabetes is one of them. As much as you may not understand it in your narrow minded view of Type 1 being exactly like Type 2. Which I recommend a trip for you also, one last link for you Mr. White and those that think the same way, to http://www.JDRF.com. Educate yourselves on the differences. Yes, there are LOTS other causes as well, as we all know there is plenty of social injustice going on in the world. But, don’t talk down to us, like we’re stupid children, when you obviously don’t know the difference between your illness of Type 2 Diabetes, and the auto-immune DISEASE that is Type 1 Diabetes. So, thanks for the “advice” (I use the term extremely loosely), and I think I’ll keep to my “cause” of being an activist for Type 1 Diabetics.